The taxonomic relationships of basal neornithischian dinosaurs from North America have long remained a prevalent problem in studies of ornithichian dinosaur phylogeny, of which the taxon Thescelosaurus is historically the most problematic. The cranial anatomy of Thescelosaurus is poorly understood, resulting in its placement as either a hypsilophodontid, a basal iguanodontian, a basal euornithopod, or a basal cerapodan by a variety of published phylogenies. As a consequence, the latest CretaceousThescelosaurus possesses one of the longest inferred ghost lineages in all of Dinosauria. Recently discovered material referable to Thescelosaurus from the Hell Creek Formation of Montana, South Dakota, and North Dakota and the Frenchman Formation of Saskatchewan have provided important new insights into the cranial anatomy, ontogeny, and species-level diversity of this taxon. Additionally, new character data has been obtained from all known North American basal neornithischian species and at least three previously undescribed taxa. This new character data was evaluated using a newly compiled ornithischian character matrix consisting of over 450 characters, the largerst ever employed to test ornithischian relationships, using only species level terminal taxa. The resulting phylogenetic hypothesis drastically alters our understanding of ornithischian evolution. Comparison of the stratigraphic conguence of this hypothesis to all previously proposed phylogenetic hypotheses (using newly developed methods and program scripts) reveals this new phylogeny to be the most stratigraphically conguent hypothesis yet proposed for the clade. The results of this investigation provide a new, robust framework for testing ornithischian evolutionary hypotheses ranging from character evolution to biogeographic dispersal patterns. More importantly, the new methods employed by this analysis for evaluating character evolution and stratigraphic congruence provide important new research tools for any study seeking to elucidate the relationships of fossil taxa. A redescription of the cranial anatomy of Thesceosaurus neglectus based largely on specimen NCSM 15728, which possesses a complete, three-dimensionally preserved skull. A detailed comparison of the largest, complete skull of Thescelosaurus neglectus (NCSM 15728) and a recently discovered complete juvenile skull collected from the Hell Creek Formation of Montana. This comparison provides important insight into ontogenetic change in the neornithischian skull, data that is currently lacking for most species. This study has also assisting in identifying cranial characters that vary during ontogeny and should be excluded from ornithischian datasets in the future. The presence of distinct crocodilian feeding traces on multiple immature specimens of a new species of basal neornithischian dinosaur from a single locality is reported. Using new specimens recently collected from Badlands National Park, a review of the pantolestid taxa previously described from the White River Group is undertaken. A study conducted with Pei Rui (lead investigator) at Peking University aimed at describing the full skeletal anatomy of this taxon based on four nearly complete specimens. 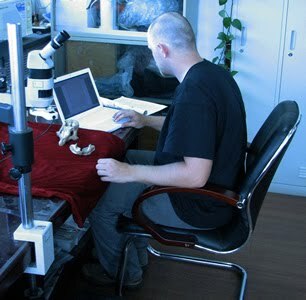 Histological examination of the long bones of these four specimens was also conducted and will be discussed. Description of a large weberian complex recovered from marine sediments in Alabama and discussion of its paleobiogeographic and evolutionary implications.